I was reminded about the Irish Estates with Irish Life celebrating its 75th birthday and mention of my thesis in the recently published Art and Architecture of Ireland, Vol. IV Architecture 1600-2000 (AAI)(eds.) Rolf Loeber, Hugh Campbell, Livia Hurley, John Montague & Ellen Rowley. I grew up close to this unusual housing estate, attending the primary school directly across the road. It still captures my imagination to this day. I have written about the history of the Irish Estates for 2ha Issue #4 A foreign country, we do things differently here. You can order any of their back issues here. The opening decades of the twentieth century in Limerick city saw an exodus of the middle classes away from the inner to the out suburbs. Subdivision by unscrupulous landlords had rendered Georgian townhouses to little more than tenement slums. These cramped living conditions encouraged tuberculosis outbreaks and the air was a cocktail of smells from the city's tannery and abattoirs. This shift was further intensified by the provision of government subsidies on new houses for owner-occupiers and local authority housing from 1924 with the House (Building Facilities) Act . This was in response to the housing shortage, acute in Limerick, of both private owner-occupiers and local authority housing which was called for by Irish Builder and Engineer in March 1923 . The Home Miscellaneous Provisions Act enacted in 1932 provided local authorities for the first time with state funding for the provision of houses. There was a lack of building materials during the interwar years which severely curtailed house building. Undeterred the government encouraged local authorities to continue building, making use of the supplies still available . Limerick had a readily available building material in concrete from the cement factory that operated in Mungret from 1938. This had great significance for Limerick as within a relatively short space of time the city saw the completion of much needed housing schemes such as the Island Field Housing scheme (1934), Thomondgate (1938), Jamesboro (1940-1), Kileely (1942) and Prospect (1944). Limerick was quickly becoming a modern city with its first Town Planning Consultant in 1938, a year before Cork. Another contributor to Limerick’s commercial expansion was having Rineanna airport (the precursor to Shannon Airport) on its doorstep. It played a pivotal role in trans-Atlantic relations securing routes during the Second World War long before Dublin. In 1946 when tenure data was first collected, less than one-quarter of dwellings in urban areas were owner-occupied (including tenant purchase schemes). By 1971 more than half of all homes (52.5 per cent) in urban areas were owner occupied. For centuries Corbally maintained a sparsely populated area except for a scattering of small but highly ornamented houses such as India Ville, Park House and Corbally Palace . Corbally Palace was the residence of landowner Pierce A. Shannon . Shannon had purchased the greater part of the townland of Corbally from Col. William Thomas Monsell in 1833 for 22,000 developing the present Corbally Road . When the Limerick Corporation was reformed Shannon took his place in the city administration becoming mayor in 1844. He also orchestrated for Corbally to be included within the city boundaries. His son Patrick Aloysius Shannon began leasing Corbally Palace and tollhouse in 1856. The house was included in the rental but it was eventually sold in 1867. This large three-storey house was last recorded cartographically in 1956 . It became the residence of Church of Ireland Bishop of Limerick until it was demolished to make way for St Munchin's College in 1958 . All that remains of Corbally Palace is the entrance gate on the Mill Road. The diocesan seminary had previously been at Park House purchased in 1809 for R.C. Bishop Dr John Young and located further down Corbally Road . Eventually, it too was knocked down for the housing development College Park in 1961. Recognising the urgency to accommodate the housing needs of the emerging professional middle classes Limerick Corporation identified 'Mr Vaughan's Lands at Corbally' in 1935 as suitable for a housing site with picturesque views of the river Shannon. This site too was once a fine mansion called Lanahrone House (referred to as Albert Villa in Griffiths Valuation 1850) . Lanahrone House was the nineteen-room residence of St Clare Hobson and stood well in from the road and commanded a splendid view of the river . Its gate lodge was on Corbally Road near the Constabulary Barracks (today Sunnyside Montessori School). This greenbelt to the north was far enough outside the city to be near the countryside but still easily commutable to the urban centre. It epitomised the Garden City model of early twentieth century urban planning. The era of the 'big house', the last bastion of luxury in Ireland was over. A request was made 'to take the necessary steps to acquire portion of the lands as a housing site' . The land remained undeveloped for a decade with the Town Planner scheduling it as 'a high-class residential area' according to the City Manager's Minutes. 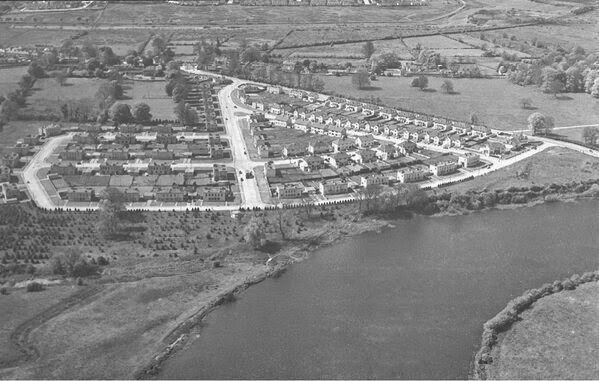 Having first established that there was a housing shortage and based on representations received from the Department of Industry & Commerce, Aer Lingus and the various transatlantic airlines who had bases at Shannon Airport Irish Life Ltd  saw Corbally as the perfect location for family accommodation for their staff. All was needed was a contractor with the means to construct these homes. 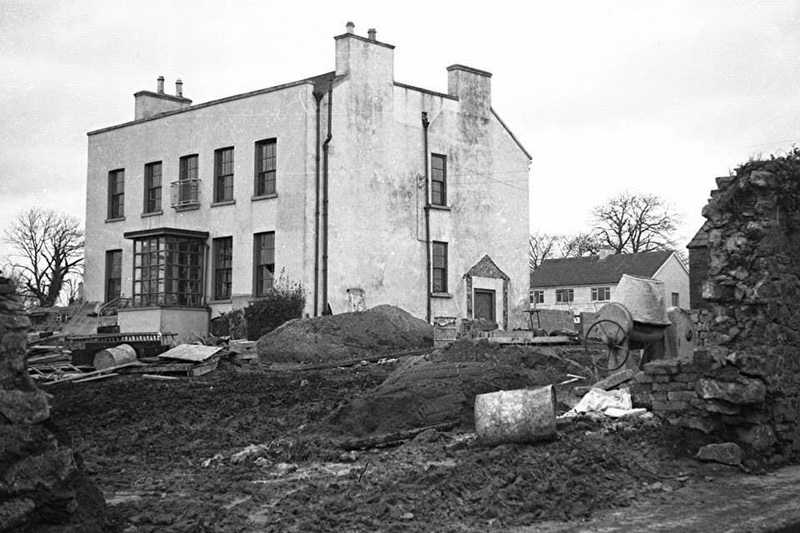 In February 1947 Irish Life submitted their offer to purchase the Lanahrone site  and Irish Estates Ltd began construction of the houses after the signing of the deeds on 3 October 1947 . The Irish Estates is a wedge shaped scheme with its single entrance on Corbally Road. 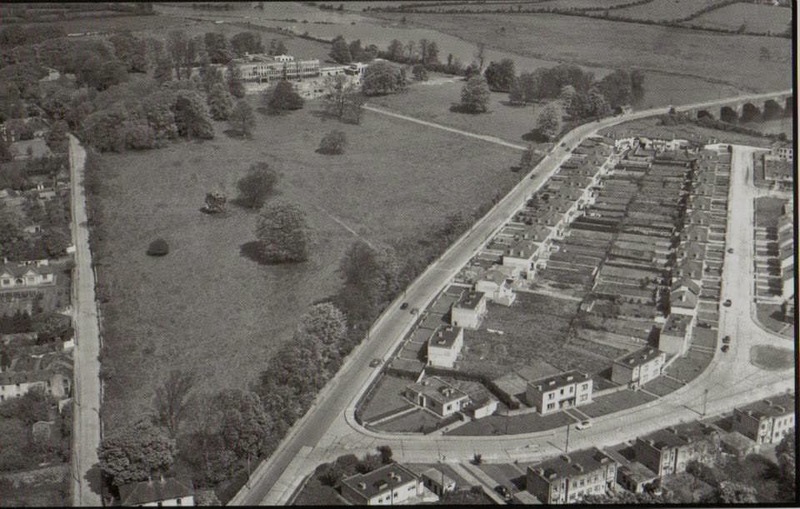 The roads of the estate were laid out in 1948 and in April of that year the Managing Director of the Irish Estates Ltd corresponded with the Limerick Corporation regarding the naming of the avenues . They referenced the historical geography of their setting being named Plassey,Lanahrone, Abbey, Shannon and Rhebogue. Lanahrone Avenue comprising of sixty houses that were first constructed in 1947-48 then contractors O'Sullivan Bros subsequently acquired a section of the site and built 74 houses. The estate was eventually completed in 1953 . The Land Registry deeds outline that the houses were to be rented and not bought outright. The rent, charged at £4 per week, was related to what a professional class family could afford. According to one resident who moved into the estate in the 1960s there was a portacabin in the fork in the road near the entrance which houses an estate manager who took care of the maintenance . It was another privilege of renting a property in the Irish Estates. The estate comprises of 140 flat-roofed, concrete-built, semi-detached houses with garden to front and rear.They have three-bays and two-storeys save for two single storey detached houses at the entrance to the estate. Indicative of the occupants' social status, each house is furnished with a driveway to park their car and a garage. They are variations of the same International Style of house with simple recessed entrance with projecting concrete canopy and originally would have had screwed metal casement windows. They have a rough-cast wall finish and a unifying platband between ground and first floor levels for horizontal emphasis.The residents have stuck with the same paint palette of light to dark greys and grey blue. Unfortunately almost every house has replaced the original metal casement windows with uPVC ones over the years and in many of the houses the internal arrangement has been altered to create an open plan living space. Each house has a garage and a fuel store to the side and garden to front and rear. All rainwater is carried off at the rear so as not to disrupt the clean smooth look of the properties. The beauty of these homes is their geometric simplicity. What makes this estate even more unusual for Limerick is the sense if space created not only by the generously large roads but also from the lack of boundary walls. This boundary-free layout is reminiscent of North American housing schemes with its expanse of green very pleasing to the eye. The original layout of the houses generally consisted of a ground floor with hall, cloakroom, drawing room, dining room, kitchen and a 'maid's room' as indicated on original plans which appeared in Irish Builder. The kitchen included the 'mod cons' of the day with Bakelite wall switches, the latest solid fuel cooker that heated the water supply and a butler's pantry. Upstairs there were 3-4 bedrooms each with ceramic-tiled fireplaces and built-in wardrobes and a bathroom. The luxury of an indoor bathroom in the forties is not to be underestimated. The 1946 Census recorded that of the 662,000 private dwellings in the country only 15% had a fixed bath, while just 23% had an indoor lavatory . Despite the fact that Shannon was prospering during this era the demand for houses in the Irish Estates was relatively weak and costs turned out to be considerably greater than originally anticipated. The project was an economic failure for Irish Estates Ltd. Eventually all of the previously rented houses were sold off to tenants and others.It is important to spell out the origins and corporate structure of Irish Life and their subsidiary company Irish Estates Ltd. It was first established in 1939 as a state body and gradually absorbed other Irish assurance companies who had got into financial difficulties. Subsequent British companies withdrew from the Irish market and transferred their portfolios to Irish Life. These included the Prudential, Britannic, Liverpool Victoria Friendly Society, the Friendly and the Refuge. The customers of Irish Life were mainly working class families who required burial and limited life insurance. Irish Life employed a great number of collectors who called weekly to collect premium installments. After the building industry was hit by recession in the fifties, Irish Estates was forced to go into liquidation in 1964 and had changed its name and its focus to property management . Ground rents were owned by Irish Life until this property portfolio was bought by Dublin Land Securities from Irish Life in 1982  and after passing hands two more times it was taken over by Lyons and Kenny solicitors in March 2007 through their property investment vehicle Fitzwilliam Land Securities . Irish Life this year became part of the Great-West Lifeco group of life assurance companies. The organisational structure of Irish Estates Ltd was quite unique for its time in Ireland. The concept which involved the combination of builder and all technical consultants, architects, engineers in a single organisation was proposed and set up by a director of Irish Estates Ltd Mr Frank Boyland who had great experience of the US construction industry. It was envisaged that Irish Estates could construct investment properties for the Irish Life investment portfolio as well as offering a cost effective 'one stop shop' to companies seeking to have built structures like housing, cinemas or factories. Most of their property portfolio was in Dublin such as Mespil Flats on Sussex Road (1959). The first such project to be undertaken was the Irish Estates. Their view was mainly based on representations received from the Department of Industry and Commerce, Aer Lingus and the various transatlantic airlines that had bases at Shannon Airport. All were seeking family accommodation for their managerial staff. The scheme was designed by Irish Estates Chief Architect W.J. Convery IAA Dictionary of Irish Architects He began his career in Belfast in the 1920s moving to Dublin in the forties to design the Mespil Flats. Convery was directed by Boyland to produce an North American style housing estate. This was to appeal to the employees of Canadian and American airlines working in Shannon Airport for companies such as Trans World Airlines (TWA), International Air Transport Association (IATA) and Pan American World Airways who among the first residents of the Irish Estates during that period. In its six or so decades the estate has been home to notable political figures such as Desmond O’Malley, TD Cabinet Minister and founder of the Progressive Democrats, John Gormley, Green Party TD and current resident Jan O’Sullivan TD Minister for Education and Skills. The housing estate represents such an exciting age for Limerick with an International airport on its doorstep, affordable motorcars and sleek design utilising the building materials of the day. These houses pre-date the housing standards set by the Department of Local Government in the 1960s regarding hot water facilities, insulation and ventilation. 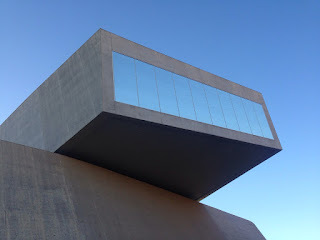 However according to the resident interviewed the flat roof has never given any maintenance issues as would be expected of the flat roof's reputation. The Irish Estates marked the beginning of intensified speculative building in the Corbally area and the end of the 'big house.' It was a slice of the American dream in the suburbs of Limerick city. 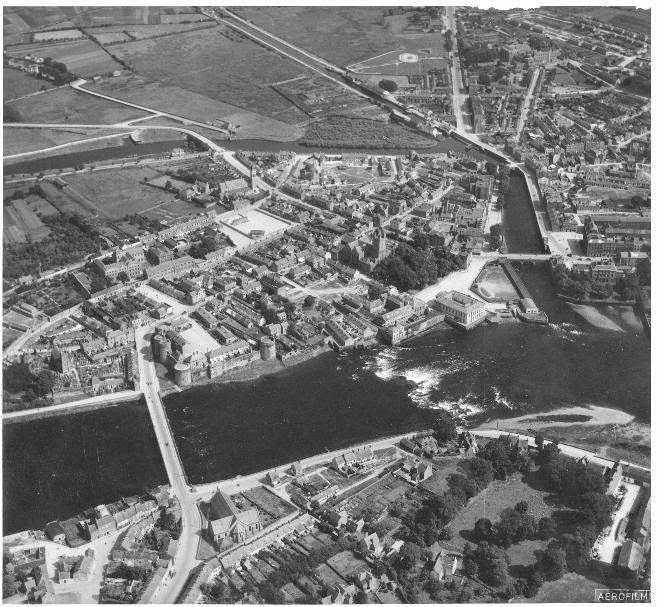 Aerial photo of Limerick city taken mid 20C (taken from Limerick Museum & Archives). 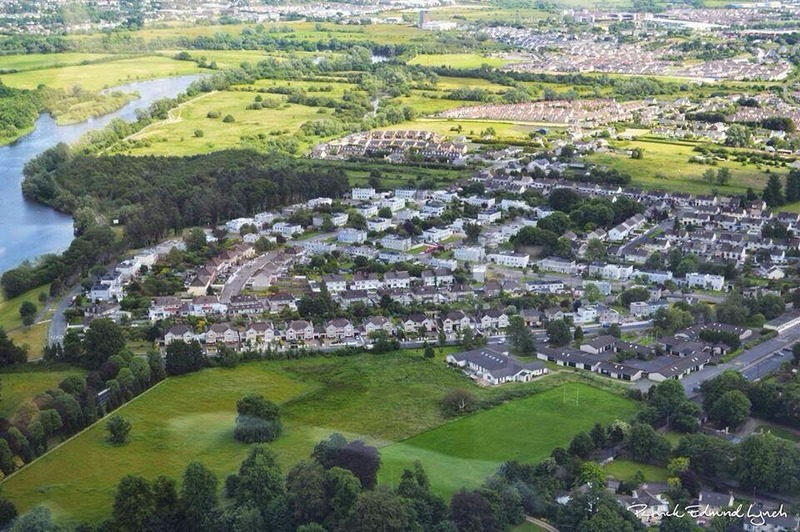 Top left of photo is the undeveloped, green Corbally area close to the city centre. 1 Mary McCarthy 'The provision of rural local-authority domestic space: a comparative north-south study, 1942-60', RIA Proc. 11C (2001), 288. 2 ‘We have little doubt that if the housing shortage is ever to be effectively met, the state will have to augment its own particular housing effort by helping the private builder by means of subsidies.’ (Irish Builder, 24 Mar 1923, 218). 3 DLGPH, Memorandum on housing, 12 July 1943, National Archives, DTS/13059A. 4 John Logan,’ Frugal comfort: housing Limerick’s labourers and artisans 1841-1948,’ in Irwin, Ó Tuathough & Potter (eds), Limerick, history and society (Dublin, 2009), 575. 5 Peter Harbison et al. Irish art and architecture: from prehistory to the present, (London, 1993), 244. 6 Not to be confused with Corbally House nearby which was built in 1824 and is today Corbally House Nursing Home on the Mill Road. 7 Shannon built up a thriving business in the Cornmarket where he traded as a wholesale ironmonger and ships chandler. He owned property totalling 284 acres including George Street, Bedford Row and Robert Street. His business ventures stretched as far as the Baltic region and Russia. 8 Maurice Lenihan, (1866) Limerick; its history and antiquities, ecclesiastical, civil and military, 473. 9 Seán Spellissy (1998) The history of Limerick city, 142. 10 John Fleming and Seán O'Grady, St Munchin's College, 1691-1761, 110. 11 Park House is recorded in the Down Survey Map of Limerick in 1657. 12 Griffith's Valuation of Limerick City, 128. Described in 1856 as a large mansion house 'erected by the late Mr Shannon' and occupied by John Co. Drydale. National Archives: Encumbered Estates Court Rentals (O'Brien), Shannon, 19 July 1856, 41:28, MRGS 39/019/-39/020. 13 Kevin Hannon, 'The Corbally District,' Old Limerick Journal, 26 (1989), 25. 14 Limerick City Council Minute Books 3 Oct. 1935 L/MIN/18. 16 'Submitted offer of Mr D.J. O'Malley, Solr. to purchase the fee simple interest of the Corporation in the plot of ground situated at Corbally adjacent to Athlunkard Bridge, containing 37 perches.' L/MIN/20. 17 'Cement workers to hold up building' Irish Times, 30 Aug. 1947 and L/MIN/34. 19 Irish Builder 98, 11 Feb. 1956: 111. 20 Interview author conducted in 2009 with Mr Paddy Reidy, resident of Abbey Avenue. 21 CSO, Census of population of Ireland, vol.4, 1946 (Dublin, 1954), 214-5. 22 ‘Irish estates being wound up,’ 10 Oct. 1964, Limerick Leader. 23 Irish Times, 7 Apr. 1982. 24 Today the ground rents are only collected for the houses of Plassey Avenue within the estate. E. Gilleece ‘The building types that defined modern Limerick city and the issues arising from the valuation and conservation of mid-twentieth century architecture’, (MUBC, UCD, 2011), 223. 25 'Mansion males way for flats; ceilings saved for state', Irish Times, 24 June 1954. A very informative article, Concrete Stew. Makes me want to visit those Irish Estates! I am the eldest of a large family which lived in Corbally (on both Lanahrone Ave and Rhebogue Ave). I lived there as a pre-teen and young teenager starting in 1963. My friends and I used to enjoy great football games on the green space at the junction of Rhebogue Ave and Abbey Ave. This was a safe and comfortable place to live, with good bus service to the city centre. Most people back then had at most one car per family, so buses and bicycles were the main mode of transportation. It was a long old cycle to school at The Crescent. Uphill both ways, with the rain always in your face!! I don't understand the relevance of citation . A plot of 37 perches (about 1/4 of an acre) located adjacent to Athlunkard Bridge would be a long way from the Irish Estates properties at Corbally. Great piece, Emma. I have shared this widely with contemporaries of mine who also grew up in the Irish Estates - in 'the funny houses with no roofs' - as people often refer to these wonderful & unique structures. Thanks for taking the time & effort involved in researching this excellent piece, - Pat Carroll, formerly of Shannon Drive.